Other than numismatists, most people do not realize that the United States minted coins with face values of two cents and three cents. The Two Cent coin was produced from 1864-1873. 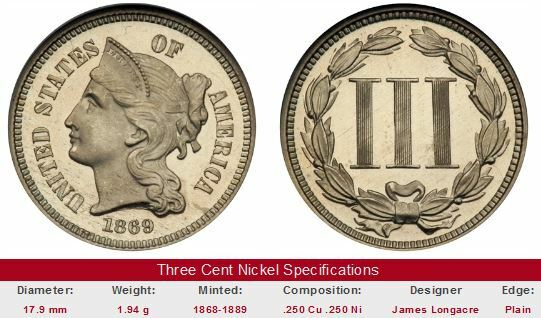 There are two design types of the Three Cent coin: the Silver "Trime" of 1851-1873 and the Copper-Nickel composition, minted 1865-1889. The Coinage Act of April 22, 1864, which created the small bronze cent, also brought about the Two Cent coin. The obverse depicted a Union Shield, a common image during the Civil War years. 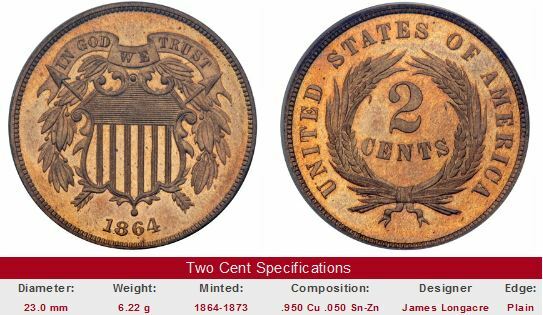 The Two Cent coin never caught on with the public, and was discontinued in 1873. The most significant aspect of this short-lived coin is that it was the first United States coin to bear the motto "In God We Trust". This was in response to the religious sentiment embracing the nation during those troubled times. Determining the difference between 1864 Two Cent Small Motto and Large Motto varieties is fairly easy. 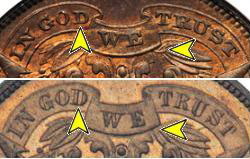 On the obverse of the Small Motto (top image above), the D in GOD is wide, and there is a stem touching the ribbon. The D in the Large Motto (lower image) is taller and narrower, and there is no stem touching the ribbon. The Small Motto variety is much scarcer than the Large Motto variety, and is considered a key date. In 1851, the cost to mail a letter was three cents. Purchasing a postage stamp always required multiple coins or receiving change back. Mint officials sought to make it easier to purchase stamps and reduce the demand for coinage by releasing the Three Cent coin. Composed mostly of silver, it was a tiny coin, and earned the nickname "fish scale" because that's what it resembled in size and appearance. 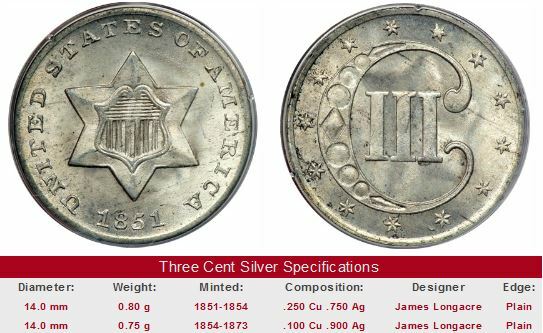 "Trime" was the name later applied to the coin, a word resulting from the combination of "tri" (for three) and "dime" (another small silver coin). Concerns over the smallish nature of the trime led to the larger copper-nickel Three Cent coin in 1865. It lasted until 1889, but never achieved the popularity that was expected of it. Key date Two Cent and Three Cent cent coins are offered for sale below. The left hand side of each "Sales Box" is value trend data over a very long period of time for a coin of that date in Fine-12 or Proof-65 condition. The percent annual increase is computed for comparative purposes. For date ranges, a representative sample date was selected to typify value trends of the group. The coin pictured for sale in the right hand side, if any, is not necessarily the same condition coin or the same date as that represented in the value trend analysis on left hand side.